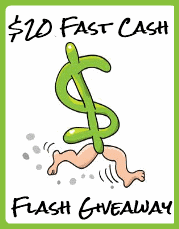 Every Friday for the next four weeks there will be a 24 hour long Fast Cash Flash Giveaway and YOU can enter to win $20.00!! The giveaway is open worldwide to anyone with a Paypal address. Entry is super simple! All you have to do is follow the hosts, with an optional entry of liking the post on Facebook! So what will you do with an extra $20.00? The possibilities are endless! However the contest is not endless. It starts NOW- and Ends tonight night at 11:59 EST! So enter NOW for your chance to win! Make sure to come back every Friday this month for another change to win!